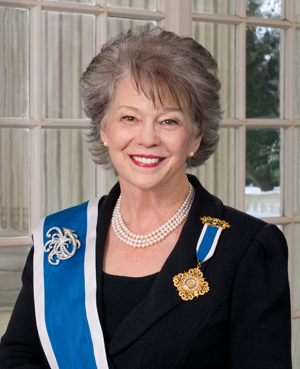 President General Ann Turner Dillon, who has been a DAR member for 39 years, brings a wealth of experience to the role of President General of the Daughters of the American Revolution. Her extensive service record includes terms as First Vice President General, Registrar General, Colorado State Regent and National Chair of the Chapter Development and Revitalization Commission, among other leadership positions at the national, state and chapter levels. Mrs. Dillon leads the 126-year-old women’s volunteer service organization with a current membership of 185,000, spread across nearly 3,000 chapters in the United States and abroad. As Chief Executive Officer of the nonprofit organization, she also oversees a professional staff of 140 at the Society’s National Headquarters in Washington, D.C. Her oversight includes upkeep and preservation of the DAR Headquarters, which consists of three adjoining buildings, two of which are designated National Historic Landmarks, occupying an entire city block near the White House. “Moving Forward in Service to America,” the theme of the Dillon Administration, expresses both a continued emphasis on meaningful service and a commitment to providing programs and resources that will enable the National Society’s mission, its members and its historic buildings to endure and thrive long into the future. A wide-ranging set of initiatives has been put in place to help achieve these goals, from new classroom resources and membership training opportunities that will provide support and encouragement to teachers and DAR members, to renovation and restoration projects that will transform the public spaces at National Headquarters. DAR members also are challenged to record 19 million hours of volunteer service to honor the 100th anniversary of Congress’ passage of the 19th Amendment. The decision to make education and training a focus of her Administration underscores Mrs. Dillon’s ultimate goal. She hopes that DAR members will know more about the National Society by the end of her term than they did when it began, and that they will have more confidence in talking about who DAR members are. “We are a service organization whose members have proven their lineage back to a Revolutionary War ancestor,” said Mrs. Dillon. She wants members to identify with and take pride in the National Society, an organization that that awards millions of dollars in scholarships every year, supports veterans, gives back to the nation, and preserves priceless historical records and artifacts that help illuminate our nation’s shared past. “There are so many reasons to be part of our organization,” she said. She was also the first woman in her family to join the National Society, beginning a tradition of membership that grew to include her mother, aunt, daughters, granddaughters and cousins. In DAR, she found a sense of belonging, and of doing meaningful work. Over time, as she took on more responsibilities, Mrs. Dillon focused on doing the best job she could while cooperating with other DAR members. She hopes to foster a similar attitude in others through the New Horizons membership training program, aimed at empowering members to take the next step in leadership. In 1990, Mrs. Dillon became Organizing Regent of the still-thriving Toll Gate Creek Chapter in Aurora, Colo. The experience, which she counts as one of her most rewarding DAR endeavors to date, taught her that leadership is not about one person doing all the work, but rather about building a group that can work together. It’s a philosophy that informed her subsequent leadership positions, which included 12 years of service on the National Board of Management. Most recently, as First Vice President General from 2013–2016, she oversaw the revision of the DAR Handbook and National Bylaws and provided guidance on matters related to the DAR Headquarters staff as chair of the Human Resources Committee. Mrs. Dillon served as Registrar General from 2001–2004, a time during which the National Society embarked upon an ever-expanding effort to digitize its genealogical and historical records, thus making them more accessible to researchers. As Colorado State Regent from 1995–1997, her State Regent’s Project involved the compilation and publication of an every member index of Colorado DAR members. When Mrs. Dillon is not immersed in DAR work, she enjoys spending time with her six grandchildren, as well as her husband, Bill, their two daughters and two sons-in-law.